Section 4.00 lists several cardiovascular ailments that could potentially qualify a person for disability. There are number of tests used to make such a determination. One such test that the Social Security Administration explains thoroughly is the exercise test. Exercise tests are for the most part exactly what they sound like. They involve using machines commonly found in the local gym, such as treadmills and exercise bicycles, to measure how the cardiovascular system responds to physical activity. Such tests can tell doctors about both the severity of preexisting cardiovascular disease or allow these same doctors to measure recovery after a cardiac event such as a myocardial infarction (heart attack). The SSA requires that all exercise tests that it purchases follow acceptable protocols. One type of exercise test is the exercise tolerance test (ETT), which is used to determine whether a claimant qualifies for disability by virtue of having ischemic heart disease or chronic heart failure. Ischemic heart disease is when normal blood flow to the heart is inhibited due to one or more coronary arteries becoming constricted. When heart muscle tissue dies due to this impaired blood flow, the result is a heart attack. Chronic heart failure is when the heart is unable to provide the other body tissues with a sufficient amount of oxygenated blood. The SSA requires that all exercise tolerance tests have specifically documented parameters and be paced to the patient’s capabilities. Another kind of exercise test is the Doppler test. The Doppler test uses ultrasound to measure blood flow in the legs while the patient is walking on a treadmill. 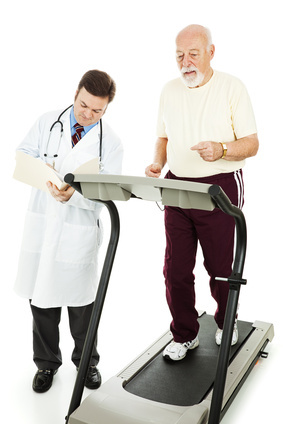 When the SSA purchases a Doppler test, the patient must walk on a treadmill at a 12% slope going at least 2 miles per hour for up to five minutes. This test is primarily use do determine if a patient has peripheral vascular or peripheral arterial disease, though it is an acceptable test to determine if a patient suffers from chronic heart failure. (1)	Unstable angina not previously stabilized by medical treatment. (2)	Uncontrolled cardiac arrhythmias causing symptoms or hemodynamic compromise. (3)	An implanted cardiac defibrillator. (4)	Hypertrophic cardiomyopathy with a systolic gradient of 50 mm Hg or greater. Other times, the purchase of an exercise test is delayed by three months to allow for “maximal, attainable restoration of functional capacity.” Reasons for a delay in purchasing such a test include acute myocardial infarctions and bypass surgeries. Exercise tests, also called exercise tolerance tests (ETTs ) are specifically listed under the entries for ischemic heart disease and chronic heart failure.